We ran auditions in the last couple of months and, with due respect to the older singers who auditioned and those already in our group of over 200, it was hugely heartening to see that the average age of those auditioning continues to drop significantly. Indeed, as a performing group, we have been getting steadily younger for several years. We had a large number of entrants and of the 22 odd we accepted, the majority were under 35, and several were under 25. It turns out that this is not an isolated event, nor one confined to New York City. At our recent conference of GLBT choral directors, I discovered that many gay choruses across the US (I'm not sure about the LBT ones!) are experiencing an influx of keen, young, radical singers, who not only find us an outlet for their vocal talents but also come to our groups because they have something to say. Perhaps it's the on-going Marriage Equality debate, or maybe it's a generational thing. 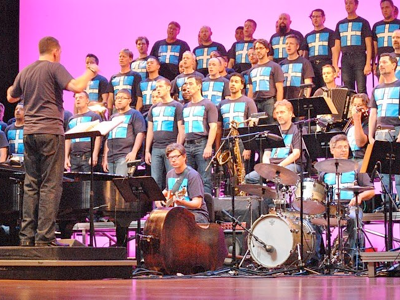 Whatever the cause, it is great to know that the future of the US gay choral movement looks so rosy. Far from becoming complacent as NYCGMC celebrates its thirtieth season, we are becoming more politicised and renewing our sense of purpose. Bring it on!